A 25-year-old man presented with mildly pruritic weeping lesions, one on each shin, of approximately a year’s duration. He had treated himself with various over-the-counter medications, including topical bacitracin and polymyxin B, without much success. 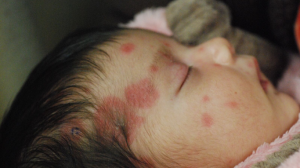 He had a history of childhood atopic dermatitis. There was no family history of skin problems. Physical examination revealed 2 erythematous plaques with yellowish oozing and crusting, symmetrically distributed on the anterior tibial region bilaterally. The plaques were large and round. 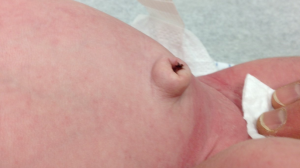 There were no skin lesions in other locations. The rest of the physical examination findings were normal. The reported prevalence varies widely from 0.1% to 9%.5 The high rate reported in some studies might be due to the inclusion of patients with disseminated eczema. The condition is rare in the first year of life, and thereafter the incidence increases with age.5 The age at onset peaks between 15 and 25 years, and again between 55 and 65 years.5 The condition is slightly more common in males than in females.3 No racial predilection has been observed. 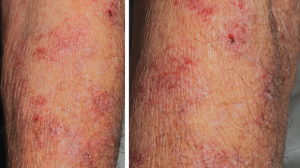 Nummular eczema has a significant negative impact on health-related quality of life due to pruritus, discomfort, esthetic concerns, social embarrassment, and impairment of professional performance.5,7 Affected individuals may have lower self-esteem. 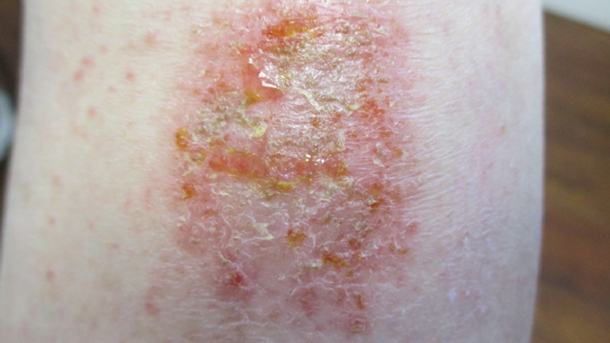 Secondary bacterial infection, especially with S aureus, may occur.8 Patients with nummular eczema are at increased risk of developing allergic contact dermatitis, which in turn may contribute to the severity and chronicity of nummular eczema.2 Chronic lesions that have been vigorously scratched may develop lichen simplex chronicus. Successful treatment requires avoidance of precipitating factors along with optimal skin care and pharmacotherapy. Any underlying condition, if identified, should be treated. Hydration of the skin is important in that it helps to improve the dryness and pruritus and restore the disturbed skin’s barrier function. Daily baths in lukewarm but not hot water for 5 to 10 minutes, followed by gently patting rather than rubbing the skin dry, are helpful. A quality moisturizer, emollient, or barrier cream (preferably one with ceramide or ceramide precursor) should be used liberally and regularly to keep the skin soft and well hydrated and to prevent transepidermal water loss. The moisturizer or emollient should be applied within 3 minutes of bathing to minimize evaporative losses. 1. Jiamton S, Tangjaturonrusamee C, Kulthanan K. Clinical features and aggravating factors in nummular eczema in Thais. Asian Pac J Allergy Immunol. 2013;31(1):36-42. 2. Krupa Shankar DS, Shrestha S. Relevance of patch testing in patients with nummular dermatitis. Indian J Dermatol Venereol Leprol. 2005;71(6):406-408. 3. Zirwas MJ. 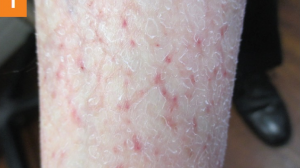 Nummular eczema. UpToDate. http://www.uptodate.com/contents/nummular-eczema. Updated August 1, 2016. Accessed December 7, 2016. 4. Devergie A. Traité Pratique des Maladies de la Peau. Paris, France: Librairie de Victor Masson; 1854:237. 5. Leung AKC, Robson WLM. Nummular eczema. In: Lang F, ed. Encyclopedia of Molecular Mechanisms of Disease. Berlin, Germany: Springer-Verlag; 2009:1502-1503. 6. Järvikallio A, Harvima IT, Naukkarinen A. Mast cells, nerves and neuropeptides in atopic dermatitis and nummular eczema. Arch Dermatol Res. 2003;295(1):2-7. 7. 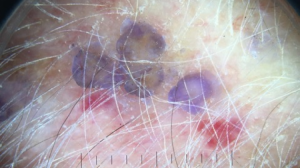 Maddison B, Parsons A, Sangueza O, Sheehan DJ, Yosipovitch G. Retrospective study of intraepidermal nerve fiber distribution in biopsies of patients with nummular eczema. Am J Dermatopathol. 2011;33(6):621-623. 8. Kim WJ, Ko HC, Kim MB, Kim DW, Kim JM, Kim BS. Features of Staphylococcus aureus colonization in patients with nummular eczema. Br J Dermatol. 2013;168(3):658-660. 9. Tanaka T, Satoh T, Yokozeki H. Dental infection associated with nummular eczema as an overlooked focal infection. J Dermatol. 2009;36(8):462-465. 10. Sakurane M, Shiotani A, Furukawa F. Therapeutic effects of antibacterial treatment for intractable skin diseases in Helicobacter pylori-positive Japanese patients. J Dermatol. 2002;29(1):23-27. 11. Le Coz C-J. 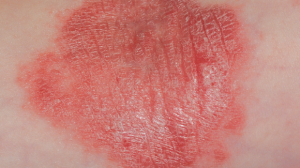 Contact nummular (discoid) eczema from depilating cream. Contact Dermatitis. 2002;46(2):111-112. 12. Roberts H, Orchard D. Methotrexate is a safe and effective treatment for paediatric discoid (nummular) eczema: a case series of 25 children. Australas J Dermatol. 2010;51(2):129-130. 13. Halberg M. Nummular eczema. J Emerg Med. 2012;43(5):e327-e328. 14. Poudel RR, Belbase B, Kafle NK. Nummular eczema. J Community Hosp Intern Med Perspect. 2015;5(3):27909. 15. Moore MM, Elpern DJ, Carter DJ. 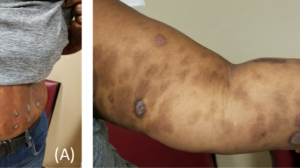 Severe, generalized nummular eczema secondary to interferon alfa-2b plus ribavirin combination therapy in a patient with chronic hepatitis C virus infection. Arch Dermatol. 2004;140(2):215-217. 17. Bonamonte D, Foti C, Vestita M, Ranieri LD, Angelini G. Nummular eczema and contact allergy: a retrospective study. Dermatitis. 2012;23(4):153-157. 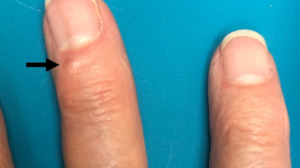 What Are These Annular, Polycyclic Plaques? 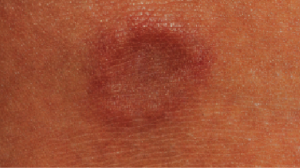 How Would You Diagnose This Man’s Erythematous Plaques?